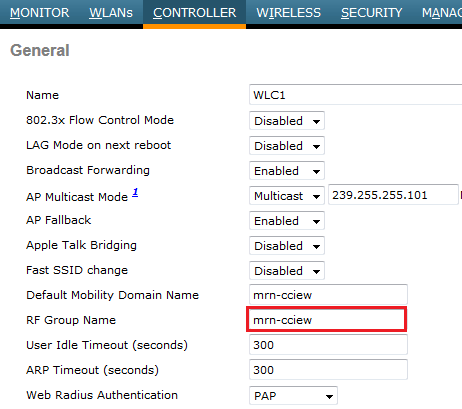 In this post we will see how to configure RRM on a cisco WLC. APs send neighbor messages every 60s at max power, at lowest data rate and on all serviced channels to the multicast MAC address of 01:0B:85:00:00:00. These messages contain Radio Identifier, Group ID, WLC IP Address (Group Leader), AP Channel, Neighbor messages Channel, Power, Antenna Pattern. If a AP receives a neighbor messages and cannot decode or it never receives a neighbor msg from an AP, that AP considered to be a rouge AP. Group Leader is the WLC with highest group leader priority. RRM is per radio band(ie separate groups for 2.4 GHz & 5 GHz) & two WLC can be group leader for these two. To configure RRM, you would need to given an RF group name for the controller. That’s pretty much it for most of deployments. During Initial Wizard you can configure this & later on change it if you want. If you want to view or edit RRM configuration per radio band, you can do that via “Wireless ->802.11a/n or 802.11b/g/n -> RRM” section. Here is the 802.11a/n RRM grouping info in one of my controller. You can change this group mode to static by choosing ” Leader” option in drop down menu. If you want do disable RRM you can select “off” option. By default it is “auto”. 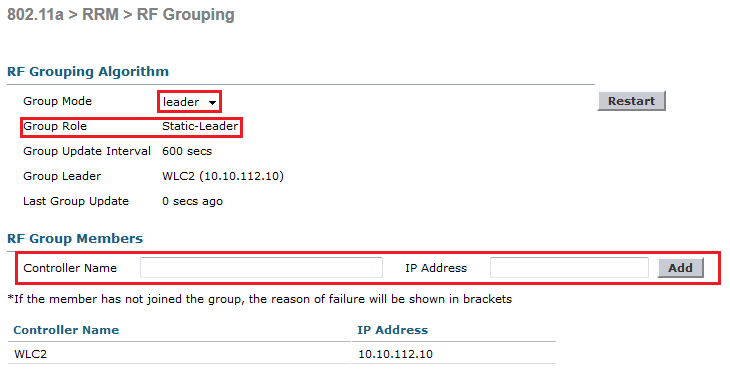 If you select static configuration option (ie Leader option) you can add members into RF group as shown in the below. In CLI,you can use the following command to do the same configuration. (WLC1) >config advanced 802.11b group-mode ? auto           Sets the 802.11b RF group selection to automatic update mode. 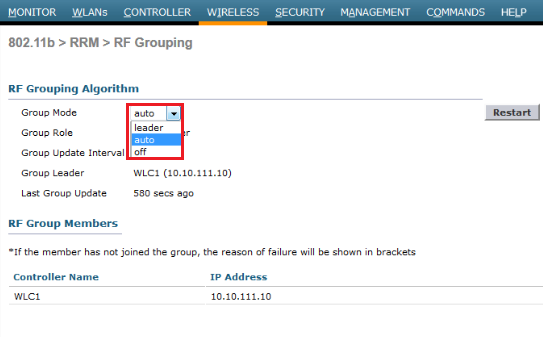 leader         Sets the 802.11b RF group selection to static mode, and sets this controller as the group leader. off            Sets the 802.11b RF group selection off. restart        Restarts the 802.11b RF group selection. (WLC1) >config advanced 802.11b group-member ? add            Adds a controller to the static RF group. remove         Removes a controller from the static RF group. 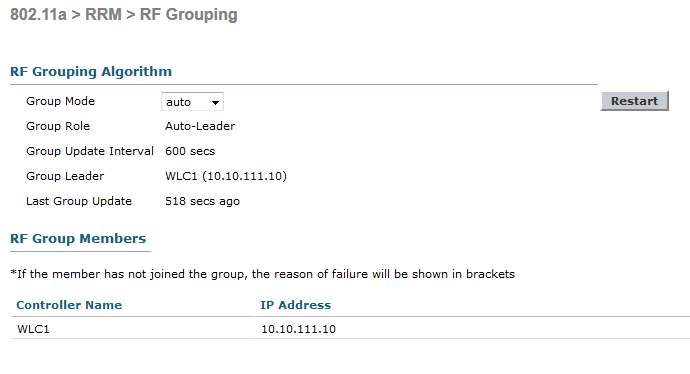 You can use “show advanced 802.11a group” command to verify the status of WLC in RF group. You can verify this config in CLI mode as well. If you type ” show advanced 802.11a channel” (since we configure RRM group leader for 802.11a) you will see something like this. You can see interference, load, coverage, AP neighbor information from “show ap auto-rf 802.11a <ap-name> ” command. Here is an example for that. 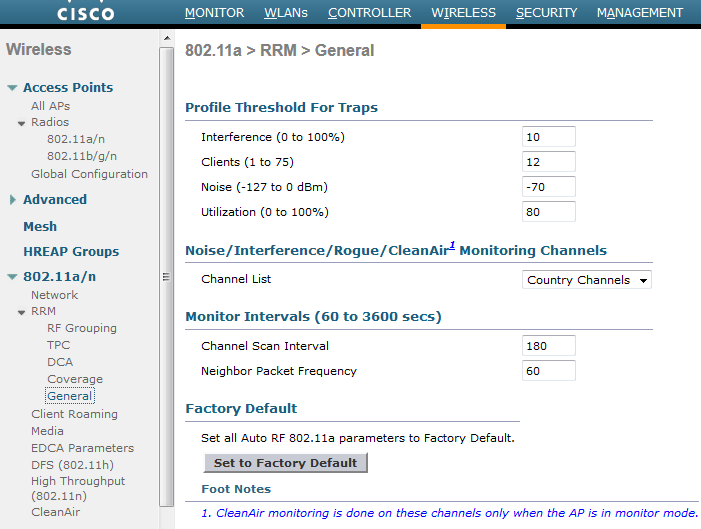 General settings of RRM can be view/modify under “Wireless ->802.11b/g/n or 802.11a/n ->RRM -> General” section. The profile threshold configurations determine the threshold that trigger SNMP trap alarms to WCS. You can change default settings (as shown in the above) to a value appropriate to your environment. APs periodically go off channel to record RRM measurment. The off-channel scanning approximately takes 50ms and is transparent to any associated clients. 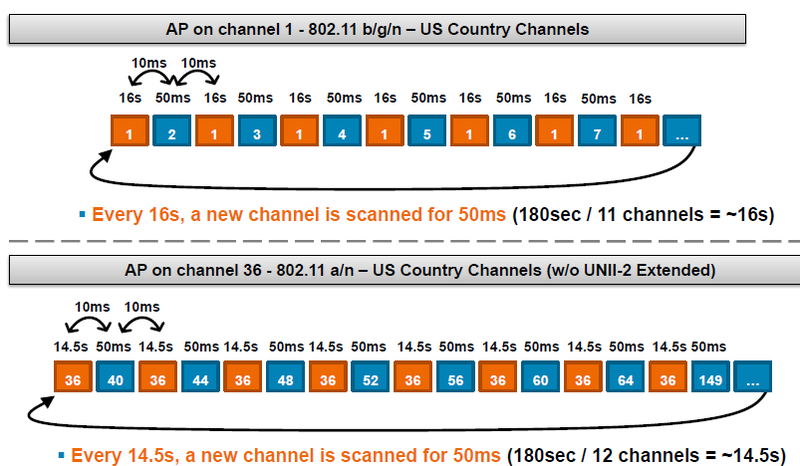 Channel duration is the interval (60 to 3600s) that AP has to scan all the channels. On 2.4 GHz band in USA, default interval is 180s, which means AP go off channel in every ~16s (180/11 to scan 11 channels in 2.4GHz). Neighbor packet frequency is how often APs exchange neighbor messages. Default is 60s. This also use to maintain neighbor list. If AP does not receive neighbor messages for an hour it will remove that neighbor form the list. RRM use Cisco Neighbor Discovery Packet (NDP) to gather neighbor RF information. Normally these packets are not encrypted & starting from 7.0.116.0 code onwards you can encrypt these. There are two modes (Protected & Transparent) available & by default it is transparent (which is send them as it is). You can use following CLI command to verify this. By using “config advanced 802.11a|802.11b monitor ndp-type protected” you can encrypt these packets. Next post we will see DCA configuration settings. Geat Article!^^ It’s really well explained. Do you know if it’s possible to use RRM on the WLC but just take it off on two AP? Actually I don’t really want to take it off, but these two APs are Nearby APs (on the show ap auto-rf command) but I don’t want them to be, is it possible to made them not see each other? Pingback: CCNP: Wireless, let's finally get this one done. do you have got the following BUG on the WLC ? We have got 10 WISM2 in 2 RF-Groups and at the first Group we have got 8 WISM2 Controllers. I hit this bug when i tried to configure them manualy. Hi there as always great article. I have a scenario as show below. Since the group role is “OFF” but the Group leader IP is the local WLC how’s the RRM working ? So if it is “OFF” then the local WLC handles RRM? NOTE: These two WLC’s are sso. This is interesting, if this is HA Pair & RF Group role is off, then I would think that WLC will not be part of any RF group with other WLCs. Thank you makes sense. So if there is an HA pair there is not need to even turn that feature on in a scenario like this. I would leave it to “auto” which is the default mode rather turn it off.